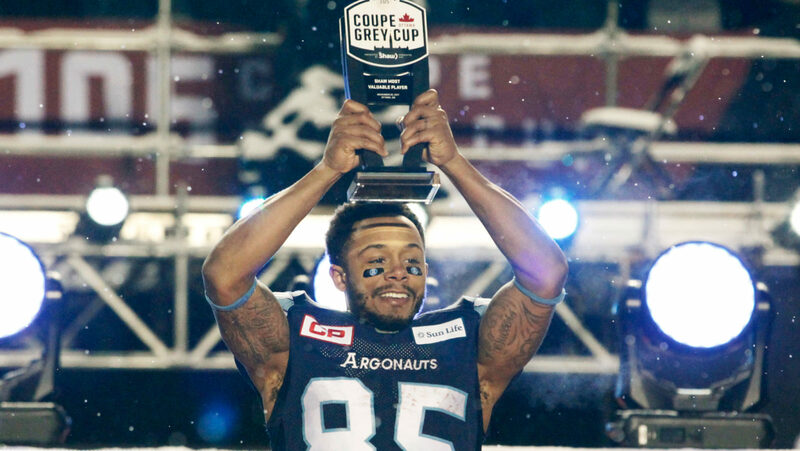 OTTAWA — Toronto Argonauts second-year receiver DeVier Posey has been named the Grey Cup MVP. Posey led the 105th Grey Cup presented by Shaw with seven catches for 175 yards and a touchdown, helping the Argos earn a dramatic 27-24 win over the Calgary Stampeders. The sophomore receiver’s big day included a 100-yard touchdown in the first half, the longest offensive touchdown in Grey Cup history. After getting his feet wet late in 2016, Posey came on strong in a lead role on Marc Trestman’s new-look offence. The primary deep threat, Posey racked up 744 yards and seven touchdowns in a shortened 12-game season, averaging 14.3 yards per catch. Posey came to the Argos after a career south of the border, where he was drafted as a receiver and a returner by the Houston Texans in the third round of the 2012 NFL Draft. Stampeders running back Jerome Messam was named the game’s Most Valuable Canadian.